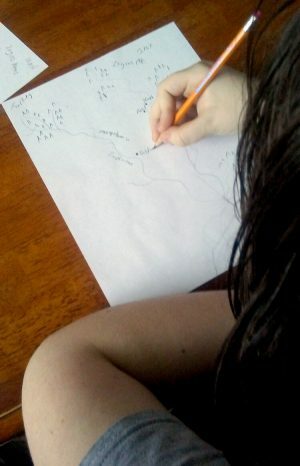 Looking for a fun way to study geography with your kids? Then you need to take a look at Mapping the World with Art from Ellen McHenry’s Basement Workshop! If you’re not familiar with Ellen McHenry’s Basement Workshop then let me introduce you! Ellen McHenry worked as a freelance illustrator after graduating and starting her family (she even worked with Dover Publications). She also started teaching science classes to homeschooled kids and discovered how difficult it was to find reliable science programs. It wasn’t long before she started creating her own products. You’ll find a variety of available curriculum at her website – most of it focused on science. With all of her resources, you’ll find interesting activities and engaging text (we’ve used a few programs throughout the year and have never been disappointed). One of our new favorites is mapping the World with Art. History Lessons: The first part of the book includes the history readings – 30 short lessons (one double-sided page for each lesson) with interesting text and images (in the e-book and paperback books). Through the lessons, you’ll cover early Mesopotamia, a variety of explorers, and end with the discovery of Antarctica. Along the way, you’ll learn about places all around the world. Drawing Lessons: The second part of the program is focused on drawing a variety of maps (more than 50 maps through the course of the program). Each lesson includes step-by-step pictures (within the e-book and paperback versions) or follow along with the drawing video lessons (available on DVD or the online e-course). 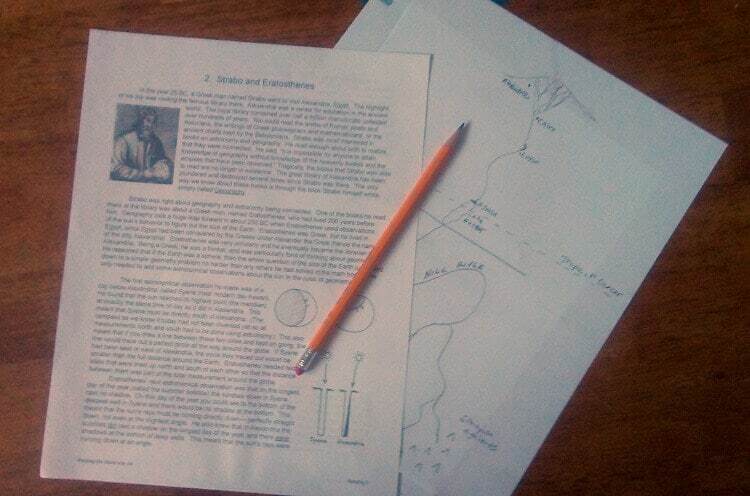 You’ll start each lesson with a blank sheet of paper and have a finished map that correlates to the history lesson reading by the end of the lesson. 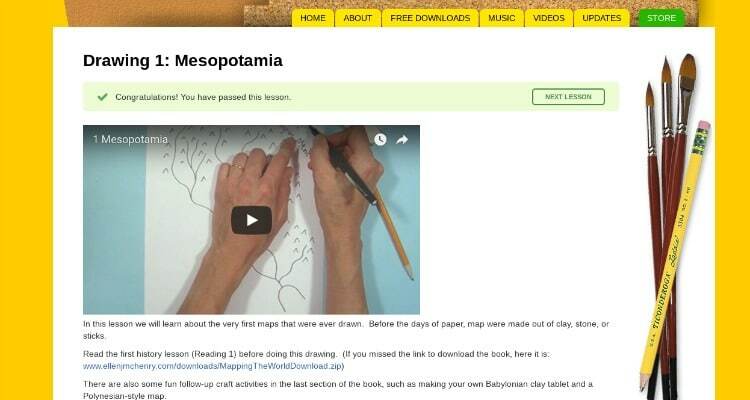 You and your kids will draw maps of the continents and various rivers and landmarks throughout the lessons. The focus is really on those features instead of political boundaries. Activities & Worksheets: The final section of the book is filled with fun ideas! It includes plenty of activities and worksheets to correspond with the history lessons and drawing lessons. You’ll find craft projects, art projects, and game ideas along with suggested videos to take the learning even further. Best of all, you could combine your children and work on the lessons together. The supplies needed are fairly standard – you’ll need pencils, black drawing pens, paper, a ruler, compass, and protractor for the mapping lessons. Supplies for the activities are more varied but includes things you’ll probably have available – cardstock, paints and paintbrushes, crayons, sculpting dough, toothpicks, tape, etc. We’re taking a laid back approach to Mapping the World with Art since we’re using other resources for history. My goal with this program was just to learn basic mapping and learning about the continents and location of various places and landmarks — and it’s working very well for that! We have a daily morning meeting time and ‘loop’ through a few different projects, including this program. When it comes up in our schedule we read the lesson text (I usually read it aloud to my daughter) and then we watch the video and follow along while we draw our maps. It’s such an interesting way to practice map skills, learn geography, and some history along the way. I love how versatile the program is – you can use as little or as much as you want and still have a full geography study. 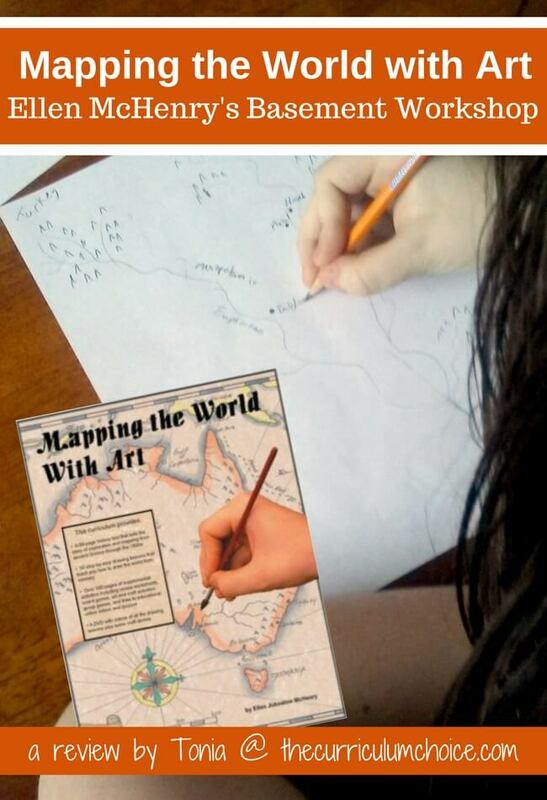 You can purchase Mapping the World with Art directly from the publisher. While you’re there, take a quick peek at some of the free resources that are available!